The No. 4 Corvette C7.R has crashed out from the 2019 Rolex 24 at Daytona, with Tommy Milner aquaplaning and sliding into the barriers during a rainy night stint. The American driver was approaching Turn 1 and couldn’t brake due to the standing water, causing him to lose control and slide into the barriers backward, ending the day for the No. 4 Corvette Racing crew. Milner emerged from the car unhurt and was taken back to the Daytona International Speedway paddock via a recovery vehicle. Meanwhile in the DPi class, Fernando Alonso is looking strong after after putting in a pair of epic night stints in the wet in the No. 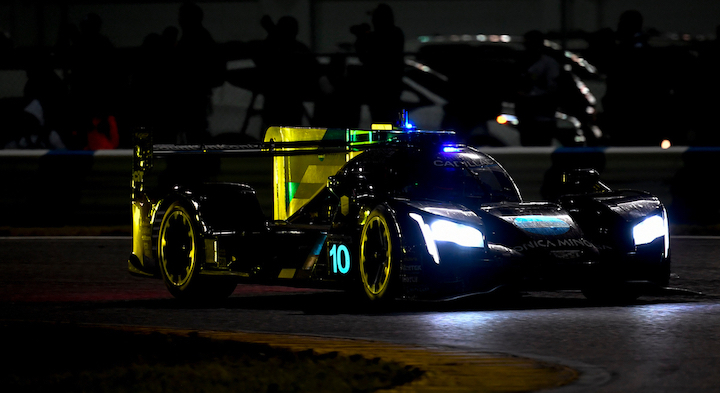 10 Cadillac DPi-V.R. The Spaniard passed the two Acura DPis following a restart in the early hours of Sunday morning and quickly began closing in on the No. 31 Action Express Cadillac as well. After dispensing of the rival Cadillac car, he gapped the field by 55 seconds. The field bunched back up when the yellow came out for Milner’s crash, however. Inclement weather and differing strategies have consistently mixed up the GTLM field. Neither of the Corvettes are on the lead lap in GTLM right now, though, with the No. 3 Corvette falling behind after running out of fuel at the bus stop chicane about 12 hours into the race. There are currently six cars on the lead lap in GTLM, with the No. 62 Risi Competizione Ferrari leading the No. 66 Ford GT and No. 67 Ford GT. Ricky Taylor currently leads from the No. 31 Cadillac and the No. 10 Cadillac, which pitted under a yellow flag, as the field prepares to go back to green in rainy conditions for the final five hours of racing. You can catch coverage of the 2019 IMSA Rolex 24 at Daytona on NBCSN or on the NBC Sports app. You can also access live race timing at this link. The checkered flag will wave at 2:35 p.m. E.T. Go Alonso!!!!!!!!! Please win it!!!!! where are all the Alonso nay sayers now? I too hope he gets the second crown. Glad for Alonso. Cadillac rules. Few people today know that back in the early to mid fifties, Cadillac were fast with performance models sporting Tri-Carbs and Dual-4 Barrels from the factory, and there were a lot of after market performance parts available even for the early Flatheads. I ran dual two barrels on a Fenton manifold on my 41′ 62-series flatty.